How can it already be day 6 of Marie’s challenge? What a rhapsody of images, emotions and insights int the lives of so many blogesses. What a wonderful week it has been! I have to confess to be terribly backlogged though – trying to read all of the posts, trying to select and upload images myself in an connectivity challenged setting. So I am very happy that the weekend has now arrived and I can try and catch up with the wealth of posts and respond to your very welcome comments. But first, while I have electricity and a reasonable connection, here is my Friday Day 6 contribution. We are in the midst of monsoon, and monsoon here is very, very monsoony! Furthermore, there is general consent that this year the monsoon has been even heavier than usual and many areas have serious flooding. I am listening to torrential rain as I sit here writing this, wondering if it will continue all night. Waiting for the rain to ease and the frog and toad chorus to start. I too wonder if the smell of our rain is indeed different to that which Brenda talked about? I think it certainly smells different to the rains which we have in Scotland. And seeing a snow-laden sky in Nancy’s post brought a rush of memory, bizarrely, of the smell of approaching snow. I can always tell if snow is on its way – in Scotland I could predict snow by the very particular scent on the breeze. 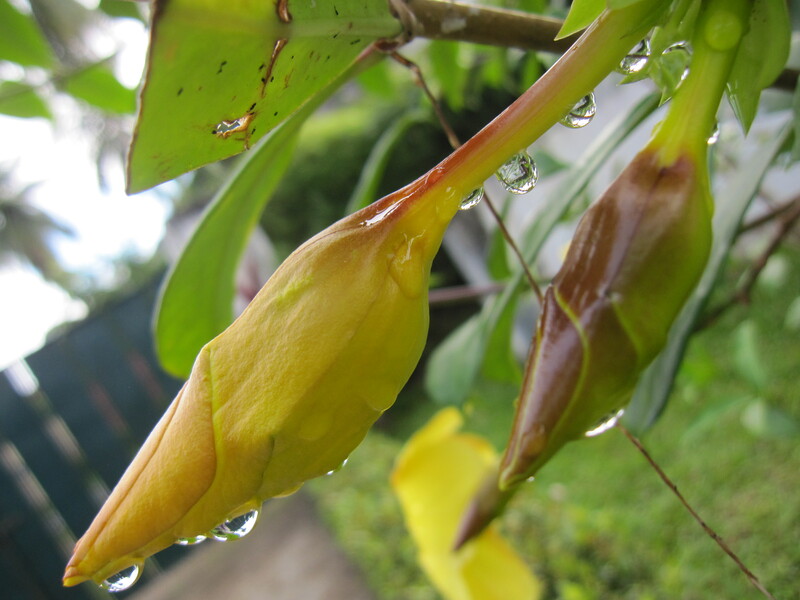 Thanks to the rains and the humidity, thought, we have the most lush vegetation and beautiful tropical flowers. (Just like Paw Paw Salad in Darwin). One of my favourite pastimes is looking out for freshly fallen frangipani in the morning on my way home from my dawn swim. I like to pick up those morning treasures, take them home and put them in a little tub of water. Every day, we have a delivery to our house. Not milk. Nor a daily paper. 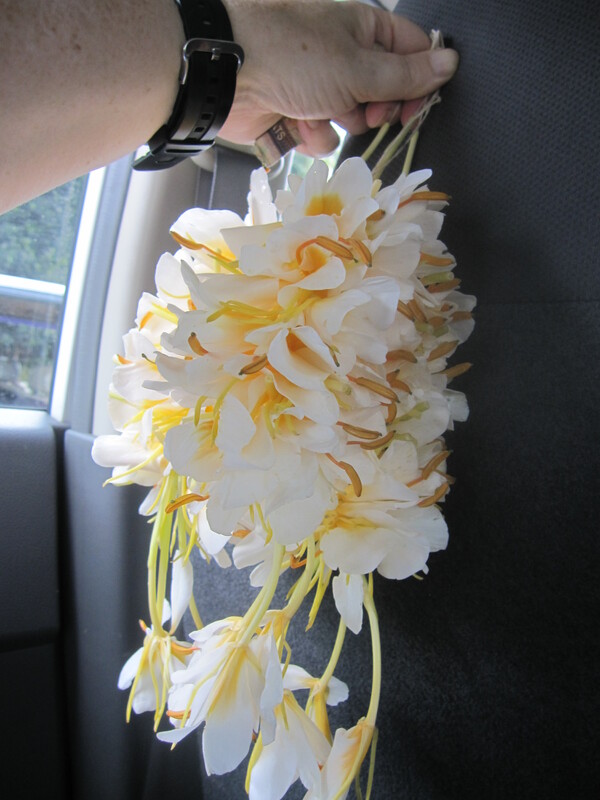 No, the daily delivery is a string of jasmine and other scented flowers which we put in our Buddha room. The flower seller brings the flowers each morning and hangs them on the gate. Once a month she calls to collect her flower money. She is happy with regular business, we are happy with our daily flower offerings. And it is a beautifully appropriate offering for the Buddha. A perfect arrangement. As if one budget line for jasmine is not enough, I also have another arrangement. On the way to work every day, either walking or if it is too hot or wet and by taxi, I have a standing arrangement where I buy jasmine or other scented flowers from the jasmine seller at the traffic lights. Those scented flowers are taken to the office, and I put the on the Buddha in the office. This morning’s picture shows what are called golden flowers. I am not sure of the correct name, that is the translation from Myanmar. They smell exquisite, and very similar to jasmine. You can also see the corner of a 500 kyat note which is part of my taxi fare, scrunched up in my hand. 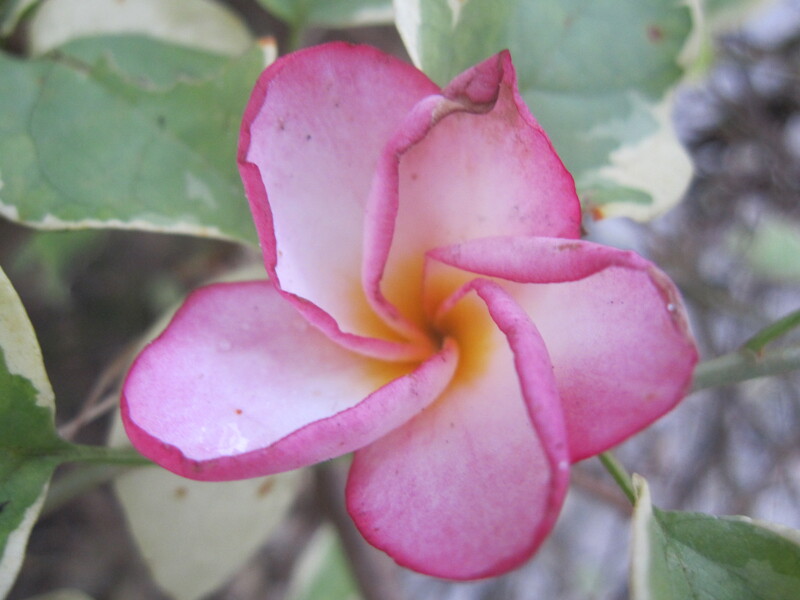 We are surrounded by flowers and lush tropical vegetation, and I never tire of it. I never tire of photographing it too! And one of my very favourite sights at this time of year, is that of a flower glistening with monsoon droplets following a torrential downpour – an irresistible everyday image to celebrate. Is it still Thursday somewhere in our world? Although I had finally managed to select one image to celebrate the ordinary, I am going to envelope it in a couple more to give it some context. And because I really struggled not to choose these ones. This is a quick glimpse of my extraordinary day with countless celebrations of the ordinary before the day starts in this corner of the planet. 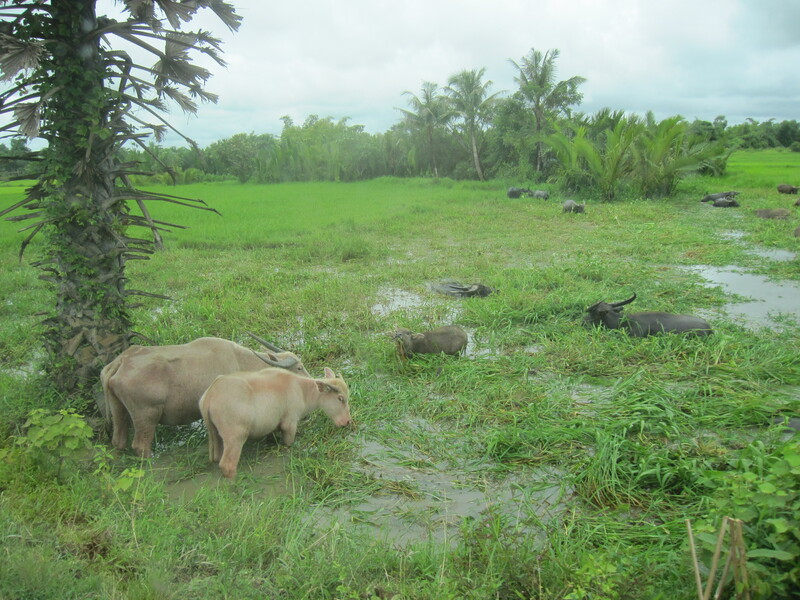 Buffalo wallowing in the water, a typical scene as we travelled out of town. Refreshments. 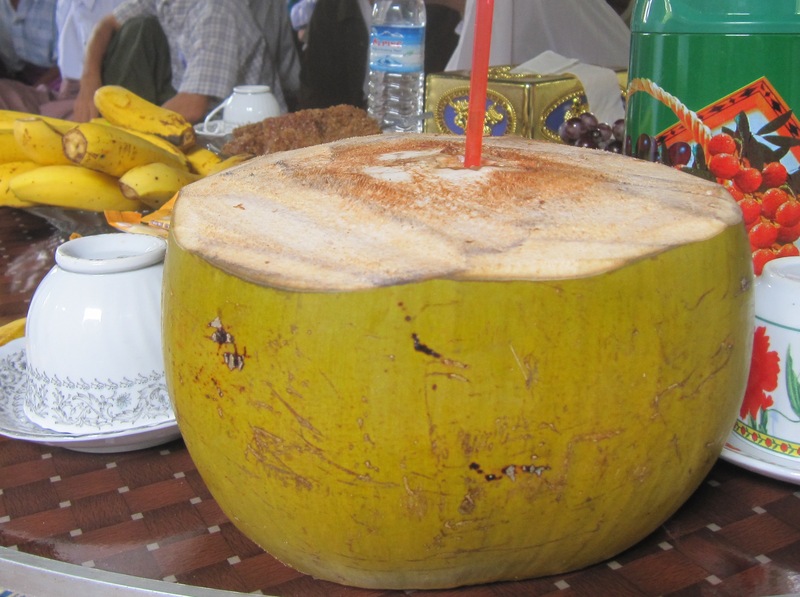 Fresh being the key element – cooling, refreshing and nutritious coconut. 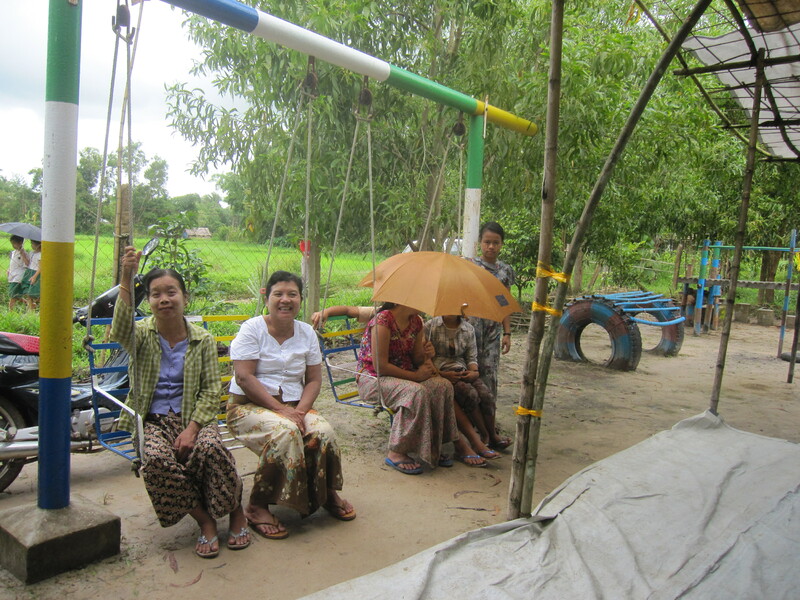 Women in the community, sharing a smile with paddy fields in the background. You can see the traditional combs used for keeping their hair up. A glimpse of typical transport – buses and trishaws. And how many girls can fit on a trishaw made for the driver and two more? I saw at least five on this one, not including the driver who had to push. And finally, the main image. The reason behind it all. An example of why I am here. 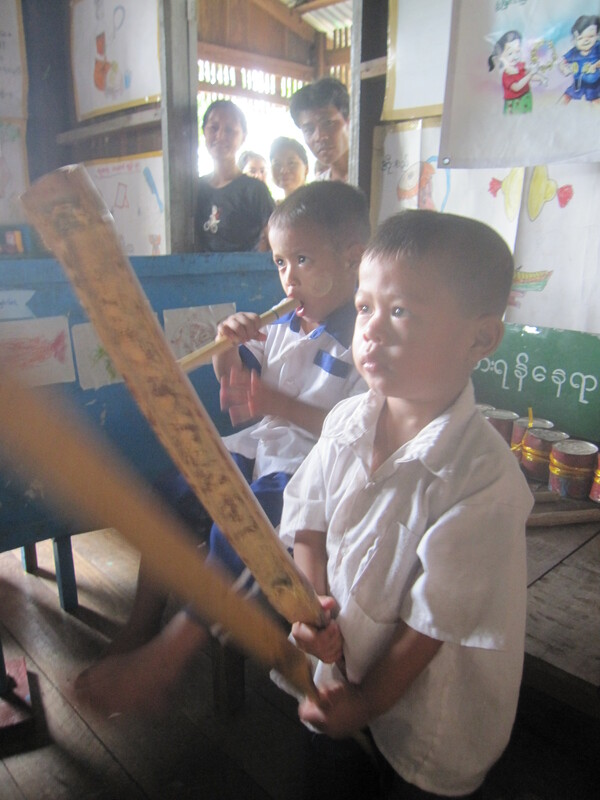 This little boy is playing an instrument made of bamboo. The sides open and when releaased make a loud “clack! clack! sound. Day 5, Delays in celebrating the ordinary! 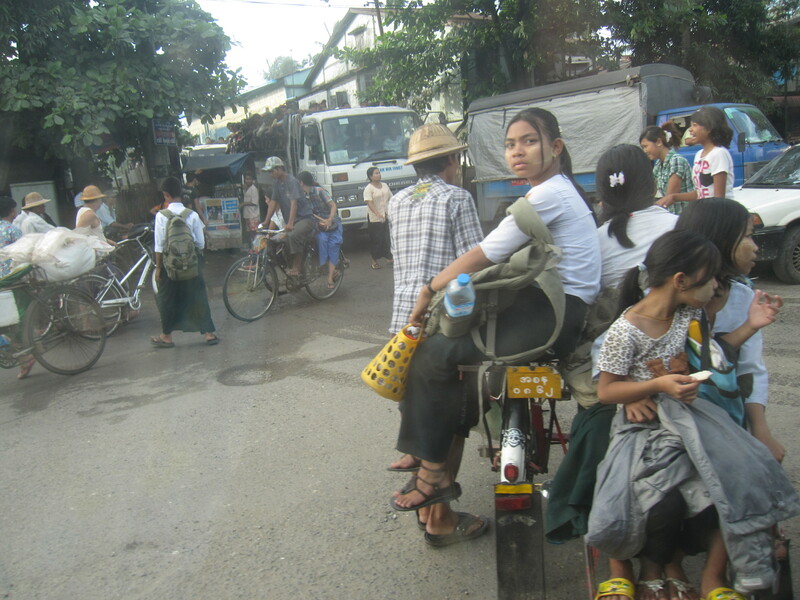 It is late evening here in Yangon, and I have returned from a full day visiting our projects out of the city. An extraordinary day for me, spending time with communities, children and colleagues in their everyday setting. Another reminder why I live and work here. Utterly humbling, inspiring and frequently heart wrenching. Of course, I have returned with memory cards crammed with memories – my camera memory card, and my own personal in-my-head memory card. I have spent some considerable time carefully sorting through the many images which all, in their own way, represent celebration of the ordinary. And finally selecting the one sole image to share. And that is where I have come unstuck. In the evenings the connection is so slow that I can’t upload more than 4% of the image before the system freezes and refuses to upload any more. So this is an apology for the delay in posting. I will try again in the early morning when the cyber waves tend to be a bit freer. It will also give me a chance on the posts I have missed, and reply to the lovely comments you have left. You can’t get much more ordinary than eating! Or can you? My celebration of the ordinary today focuses on our lunchtimes. And more importantly our lunches! Pretty much every day I have lunch with my colleagues, and the scene depicted below is a fair and accurate impression of the daily experience. 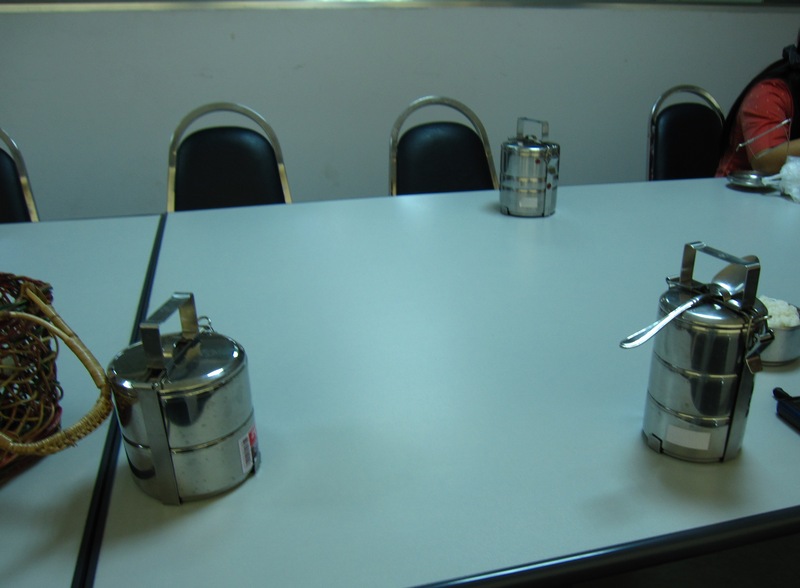 The hero of our lunch is in fact the amazing yet humble tiffin box. This perfectly designed lunchbox contains every element and nutrient needed for the perfect lunch. They are produced in an unending variety of designs with two or three layers or even more, different sizes and different widths. We can procure the perfect tiffin box for our needs. My own tiffin box has two storeys and I carry it to work in the cutest little wicker basket. 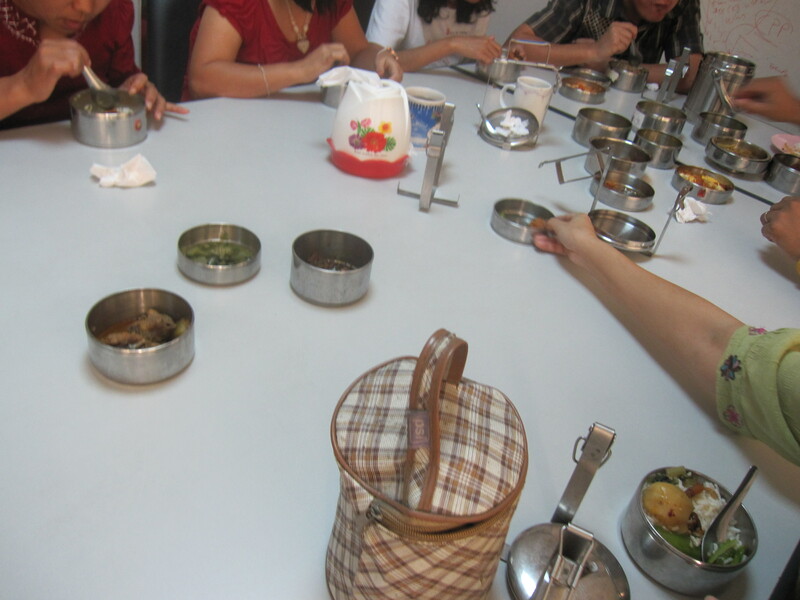 In the lunch room we sit together, dismantle our tiffin boxes and spread the various dishes we have on the table. One of the nicest things about Myamar culture is that we share the assortment of dishes freely, tasting and savouring such a wide variety of flavours and regional specialties. 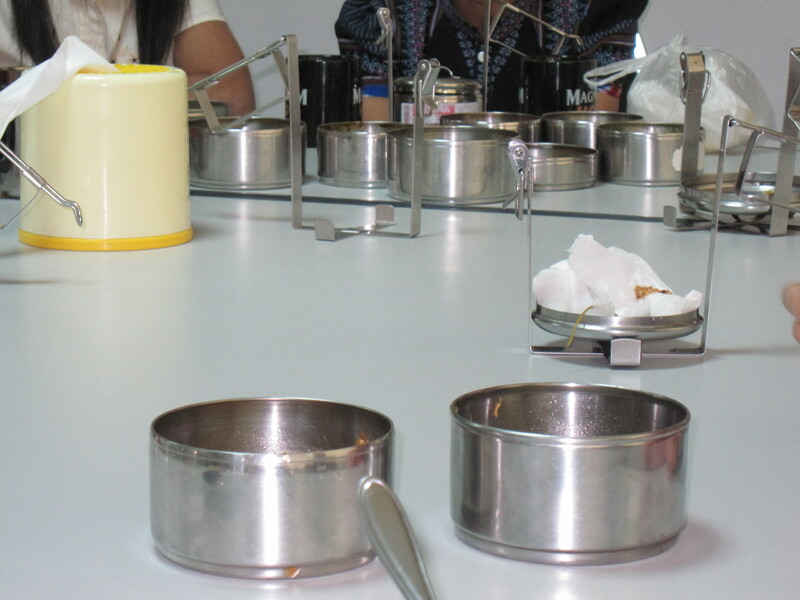 And then, at the end of the meal, when every last bite is finished, the hotch potch of assorted tiffin tinlets are magically rearranged back into their individual tiffin boxes ready to be dismantled, washed, taken home and prepared for the next day’s lunch. So today, I want to do something a little different. I am perhaps cheating a little in that this is not one of the images I have taken today (oh yes, of course I have already taken quite a few) but a picture from my “archive”. And of course there is a story behind this. For going on 20 years, I have regularly spent time on the tiny Scottish island of Lismore. The island has a population of around 150. Yes, 150. 150 people, not homes. The island itself is around 10 miles long (perhaps 16 kilometres) and at its widest point, around 2 miles wide. Which is just over 3 kilometres. A tiny island with a tiny population. Every year, when I visit the UK, I always try and spend as much time as possible on the island, and was able to spend longer than usual there after the nine months of cancer treatment. Spending time there is not as easy as it sounds given the fact that my family are spread around the UK and getting to Lismore (on public transportation) is complex. It involves trying to coordinate bus times, train times and ferry times and usually means a dawn start to get to the island the same day. However, once on the island, time slows down and the important things take over. Precious time with family, long walks exploring the island, and my usual jaunt to the minute tidal island of Bernara just at the western edge of Lismore. If Lismore is tiny, I am not sure how to describe Bernera. To get to Bernera, it is vital to check the tide tables, as the island is only accessible at low tide when the causeway appears. I have spent hours there, watching the tide go down and the path miraculously appear, watching the tide come up slowly and the island become distinct from the bigger island, and especially watching the inhabitants of the island. And I am sure there must be a lot more than 150 of them, a clan of hardy, common grey seals, hanging out, fishing, swimming and lounging on the stony shores of Bernera. It is fortunate that the Scottish summer evenings are so long, as it gives so much extra time to wander, watch and wonder. 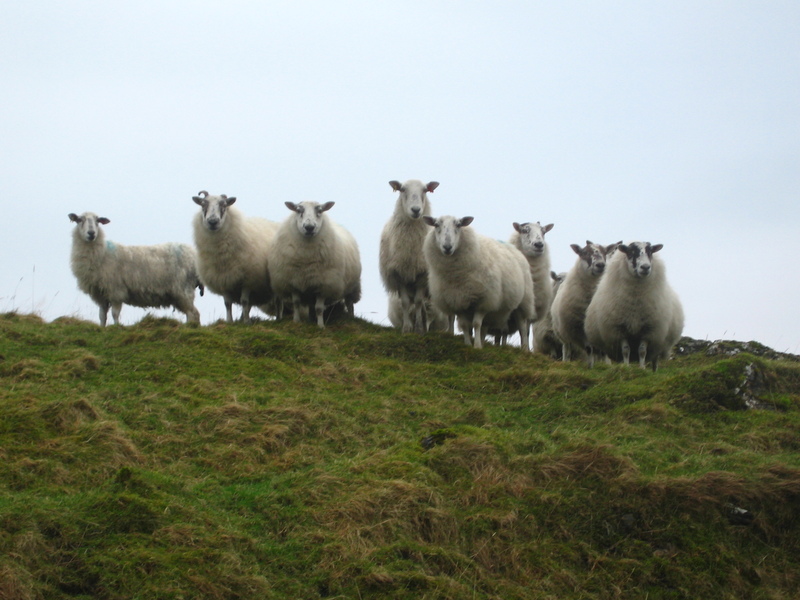 In addition to the seal population, there is a sizeable sheep population which must far exceed the number of human inhabitants of the whole island. It often feels as if they are the ones in charge. I do not know how many times I have looked back, or up, to see a number of eyes fixed on me. And that is the image which I want to share today. But times are changing, my future visits to the island unsure and my long breaks there unlikely in the same way. I will have to rely on memories and the many photographs, and of course there are some pictures of visits to the island as well as a few from the island itself. Celebrate the ordinary today, because tomorrow may be different. It is awesome because I am enjoying it so much. It is awesome because it is so all encompassing. My goodness, this is going to be a less than gentle re-introduction for Marie, I do believe! Already I am losing track of all of the wonderful images, and the beautiful stories behind them. It is also awesome because I get to share some of the innumerable everyday gems which I treasure, living and working here in Myanmar. So this morning, I made sure that I had the camera with me when I got up at 5.30 am to get ready for my swim. I love my walk to the place I swim, and I knew that there would be no shortage of ordinary wonders. Little did I know that the snapping would start even before I was fully dressed! That image is not the one I will share today though. As expected, there were plenty of moments and impressions that took my interest. By the time I had left home, walked to and from the pool and eventually arrived at work, there were a silly number of images to choose from. i soon realised that I would indeed be struggling to select just one for the day. (I have a plan in mind for those photos which will not make the daily “cut”, but I will share that later). I did finally manage to select just one – and this is what I have chosen for my Monday picture. This was the scene at my front door as I left for the pool this morning. One of the first tasks of the day here is the sweeping up of leaves, dust (in the dry season) and generally tidying up. It is kind of ritual cleansing, so that the day starts fresh and clean. The brushes used are traditional, and give a gentle “swish, swish” sound as the sweeping is done. The brush was resting against one of the plants, mid way through its sweeping work. A simple, ordinary, daily sight. And one to celebrate. For one week, starting Sunday, I would love for you to join me……… it’s about celebrating the ordinary simple things we can sometimes take for granted each day. So, will you join me in finding one thing each day to take a picture of to remind us of the simple ordinary pleasures in life? If you have a blog, then please post the picture and leave a link here. And if you don’t have a blog, you can still join in on Facebook. Just upload your pic to the JBBC Facebook page where I will also be posting everyone’s pictures. Looking forward to seeing your contributions! Irresistible! I was already in the midst of preparing a post, which would herald a new aspect to my own blog – I guess I could call it the Background Image Backstory? So to start the week of celebration of the ordinary, I am using the image I was poised to share and describe, the image which was the first background image on my New Look Blog. This is a photograph which I actually took during my Christmas break, in 2010 in Ngwe Saung, on the western coast of Myanmar. I was fascinated by the patterns appearing on the sand, and ended up taking a number of photographs of the various designs and patterns. 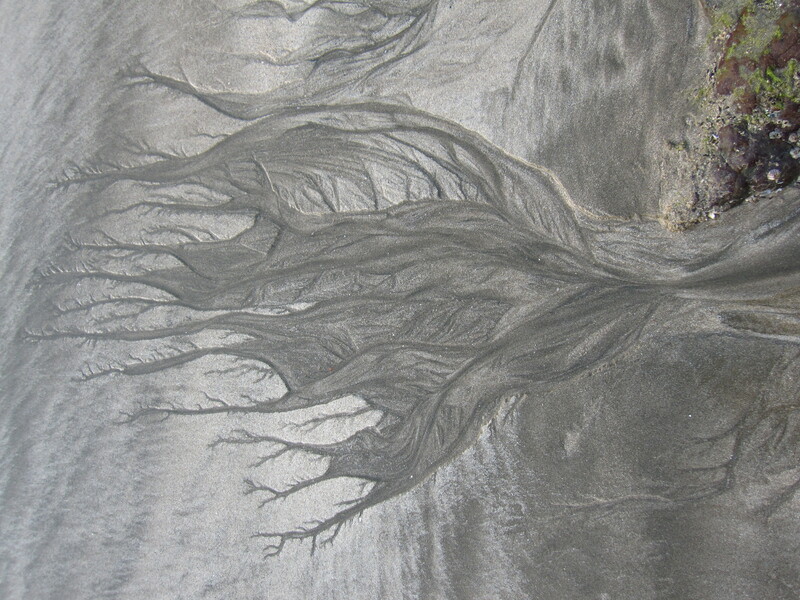 This image is of a design left in the sand as the tide went out. These incredible designs were everywhere, all I had to do was open my eyes and celebrate them in their extraordinary simple sophistication. It may come as no surprise that I photographed very many of these various images, including the patterns left by burrowing tiny crabs and doodles by sand slugs. There is a full album of these on my sister blog, where I post photographs of my life here, and another album of that Christmas break in black and white images. As the week of this challenge progresses, I will be sharing images, new shots and some from my archive, to celebrate the ordinary. The biggest challenge is only selecting one each day for only a week!